Your customers love to find desired products fast without refreshing the product list. Magento ajax filter perfectly solves this task by providing your users with possibility to filter items by required attributes and custom options. Filter products in Magento by any available attribute or custom option. Easily switch product filter position between the horizontal or vertical layered navigation. Ajax Filter algorithm works super-fast with small and large product databases. Product Filter Magento extensionwill be much appreciated by your customers. The Product Filter Extension is going to save their time by sorting product collections according to selected criteria. Your customers will be able to filter products by attributes like color, price range, manufacturer, size, rating, stock status or any other attribute. Additionally, Ajax product filter is designed to refresh the product list without reloading the category page. It works fast with very large databases and can be displayed in the top toolbar (horizontal layered navigation) or left sidebar (vertical layered navigation). Finally, admins will appreciate the handy drag and drop interface to manage product filter attributes and custom options. AJAX Filter allows customers to filter products on product list page without page refresh. Fast page load will improve customer experience, decrease bounce rates and increase sales. New filtering algorithm was tested on databases with 80,000+ products, 1200+ products on a single page and 60+ pages of pagination. Works fast with small and large product databases with or without pagination. Easily switch product filter position between the top toolbar (horizontal layered navigation) or left sidebar (vertical layered navigation). Module supports filtering of products on Magento Search Page. All available product filter attributes and custom options can be enabled or disabled from module configuration page. Admin can create custom filters, group filter attributes, set sort order and change title of attribute groups. The "manual refresh" allows customers to select multiple attributes and then click on the button to "apply filter"
Magento Product Filter was designed to work flawlessly on major third party Magento themes. It comes with built-in template support of Magento RWD theme, Magento Enterprise RWD, Ultimo, Shopper, Fortis, Buyshop, Porto, Milano and Acumen theme. Compatible with Community and Enterprise Editions of Magento 1 Ecommerce Platform. Admin can display Product Filter in the left "sidebar" or "toolbar"
Magento Product filter was created with responsive design in mind. It works great on all devices - from PC to tablet and mobile. Had some troubles installing it, but they helped me quick and everything is working just fine now. Thank you Plumrocket. Next time i will be back. I looked at a lot of layered navigation extensions, but Plumrocket is by far the best module with no hassle of any kind. The setup and implementation was easy and the customization to fit our website design was by far the best to work with. The support from Plumrocket is out of this world and I will certainly use Plumrocket in the future. I have already purchased other modules from Plumrocket. I highly recommend Plumrocket and certainly Layered Navigation to everybody who are looking for this kind of module. Found a lot of plugins, think this is the best Product Filter Extension and can be very compatible with my theme.I highly recommend it! You should not miss it! This is very flexible and allows us to have the category filters we need for our retail store. We did look at other extensions on the market but found this was most suitable and with good backup. I did lots of research before settling on this Layered Navigation upgrade. Great improvement over the stock 'Shop By' navigation. I recommend this Plumrocket product. Layered Navigation & Product Filter Extension for Magento 2 works fast and is amazing. Customer service and support are excellent. I am happy with my purchase. New update works amazing and it is really fast. Love the option to manage attributes and works great with my custom theme. Thank you for great support. I have searched long enough for an extension for my needs. Thanks Plumrocket with the service it was finally as I wanted it. Awesome module, it works really fast and allows our customers to refine through the products conveniently, easy install and use. The extension works great with my theme. Thanks! Very nice extension. I have used it, and want to say that it works really fast and allows our customers to refine through the products conveniently. Good substitution for default layered navigation. 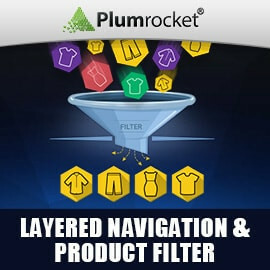 After researching a few other product filter solutions we decided to go with Plumrocket. The filter fit our needs perfectly and works great. With this extension we eliminate the loading time. The installation and use is very easy. It can handle a lot of products and the responsive design is a big plus! Its the fastest filter on the market! We have integrate this extension and increase up to 20% our product sold. Customer find appropriate product very easy. This module was great and support is awesome! I use this extension for Magento2. Good tech support and coding style. Excellent support. The extension works great with my theme. Thanks! Yes, it filters good enough. I use it and like. I think plumrocket has to make it load with pager. Good for the price. Needs some Work. Overall positive. This particular extension didn't work properly for my store, but I also list tens of thousands of products. If you have a smaller product offering and want to move away from the native Magento filtering, this is a good extension. I was looking for something particularly where I could allow customers to choose more than one attribute, and this allows it. If you have complex products, and want to guide your customers in a simple search filtering results, this is a top extension. The support is great and I was able to customiza the look for my theme. This extension works amazing. The support the best! This extension works just fine. You can't ask for better option at the suggested price. I also customized it with plumrocket in accordance to my custom theme. While I still have not purchased this extension, I believe it will be very handy and useful for customers to be able to filter product by type and options without the need to wait for the page to load. This is handy as it eliminate the left or right column to allow you add an extra image column! this is amazing filter extension! works fast, no needs even reloading a page. easy install and use. Improved compatibility with Magento Configurable Swatches. Now, when the filter by color is applied - the product with proper color will appear in filter results. Product custom options are added in module backend and can be used as Filters. Available filter attributes can be enabled / disabled from module configuration page. Removed underlines from attribute names. Added support of attributes with option "Filterable (with results)".